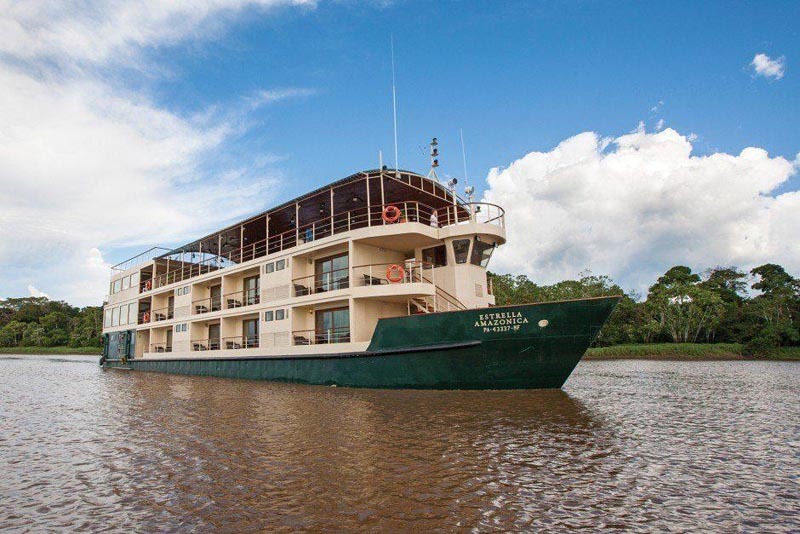 Last week we were in the Peruvian Amazon taking a cruise with International Expeditions. It was supposed to be a relaxing time but then Dave broke his back. I mean, we've cycled from Cairo to Cape Town in Africa, driven a beat up car from England to Mongolia and survived climbing mountains, white water kayaking, epic wilderness treks and countless other adventures around the world. 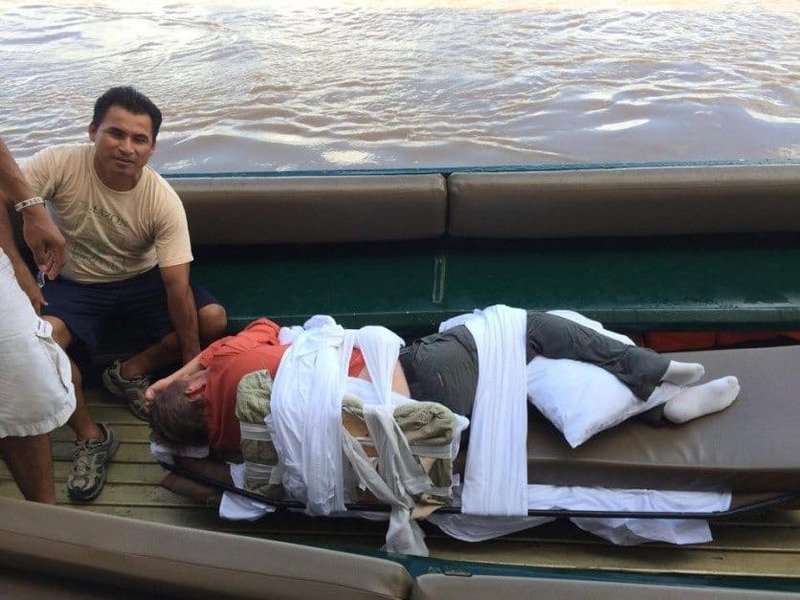 Getting hurt on a cruise made for birdwatching, village visits, and daily boat rides out to explore the calm tributaries of the Amazon River wasn't exactly a spot we expected anything to happen. This was a comfort cruise with fine food and nightly entertainment for crying out loud. It was 4 days into our voyage that we went for a jungle walk. Dave decided at the last minute to run back to the skiff (a small river craft used to explore tributaries of the river that the cruise ship can't get down) to grab his flash for his camera. Looking back, we could almost see something was amiss. We had actually discussed at length whether he should leave his camera bag on the boat or not. (normally Dave takes it everywhere he goes, no questions asked) The hike was going to be a short one, and did he really need all his gear? I stood waiting for him to run the 30 meters back to the skiff and within seconds of him leaving I heard horrible cries. I had never heard Dave scream like that. To my horror, he had taken a terrible fall as his feet slipped out from under him and he came crashing down on the steel steps directly on his back. He didn't have time to react and nothing but his spine broke his fall. Seriously Injured but how bad? Luckily there was a nurse on board who acted quickly organizing the guides, boat drivers and kitchen staff to carefully move Dave to a safer location on one of the padded benches. Every move caused him to scream even while laying on his side with two people holding him steady. I put cold towels on his back meant to give to the passengers to cool their necks but nothing eased his pain. It was nearly an hour before we could make our way back to the main cruise ship. When we got there, it was an impossible situation. How could we get Dave out of the skiff and on to the boat? 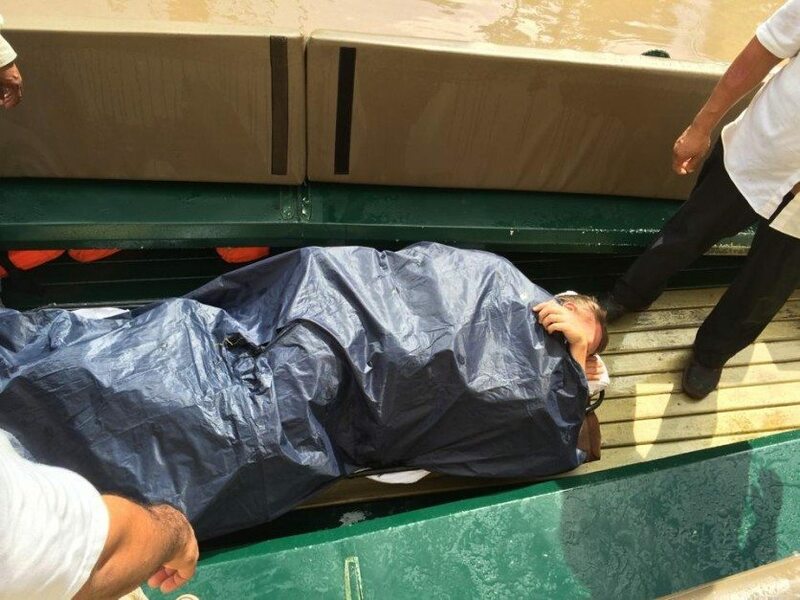 The staff ended up carrying him on a makeshift stretcher through his balcony window from the boat to rest on the bed in air-conditioning before deciding what to do. Luckily, we have full medical insurance and a medevac was the only option. We didn't know the extent of Dave's damage, but I know my husband, he doesn't cry in pain for anything. If we didn't have medical insurance, I'm not sure if we would have reacted so quickly. We may have said, “let's give it a few hours and see if the pain subsides” It would be a scary thought to know that you may be stuck paying for an expensive flight. We had full medical and travel insurance through American Express Canada to cover transportation and medical costs. We called them to inform them what was going on and they put our mind at ease assuring us that we were cared for. It took four more hours of waiting for the float plane to arrive. 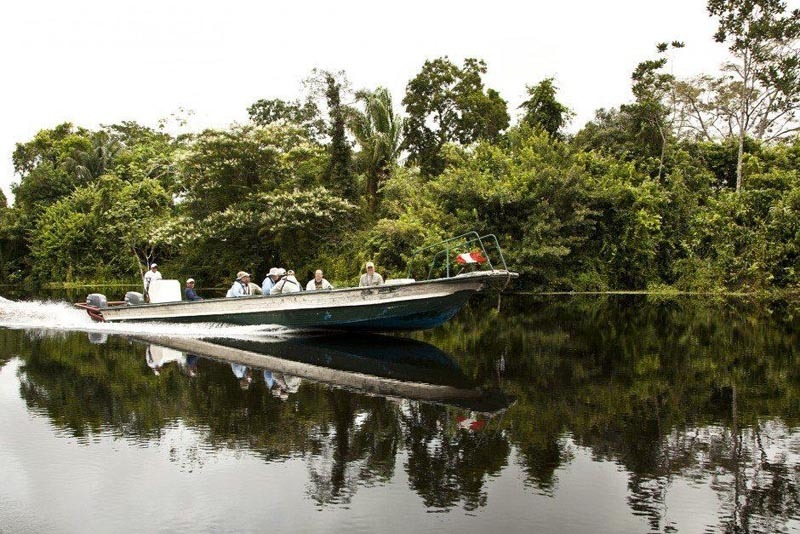 We were about as far out from civilization as you can get, being four days into the Amazon from the already remote town of Iquitos. The only way in or out is by boat or flight. The massive Amazon rainforest surrounded us from every side. With the weather closing in, it was difficult to secure a plane to take us back to town. At one point they were looking into calling the army! Finally, a plane came at 2 pm and once again, the crew and guides rallied together to carry Dave out through the balcony door onto the skiff boat to load him onto the tiny float plane. I was terrified that he was going to be dropped in the water and started panicking. Retired nurse Joyce who had taken complete control of the situation reassured me that nothing was going to happen. Strangely at this point, even though Dave was in extreme pain, he saw the absurdity of the situation and yelled at me to take some photos. Once we got on the plane we thought it would be smooth sailing, but it wasn't for another 6 hours that he would find a bit of comfort in the hospital. It's a long story that lasted 11 hours what happened next and I wrote about it here. 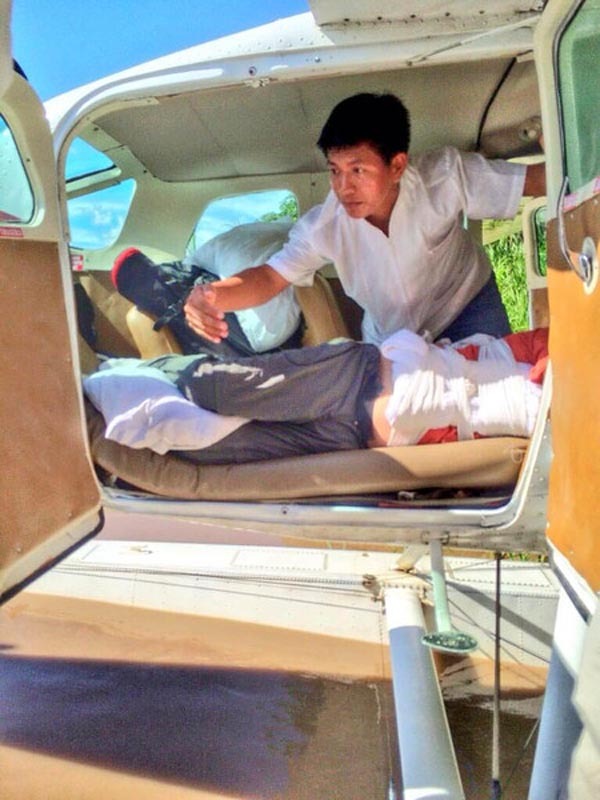 But we ended up landing in a village on the river where we caught a tuk-tuk and then an ambulance to the hospital. It was an emotional roller coaster and all we wanted to do was get home. 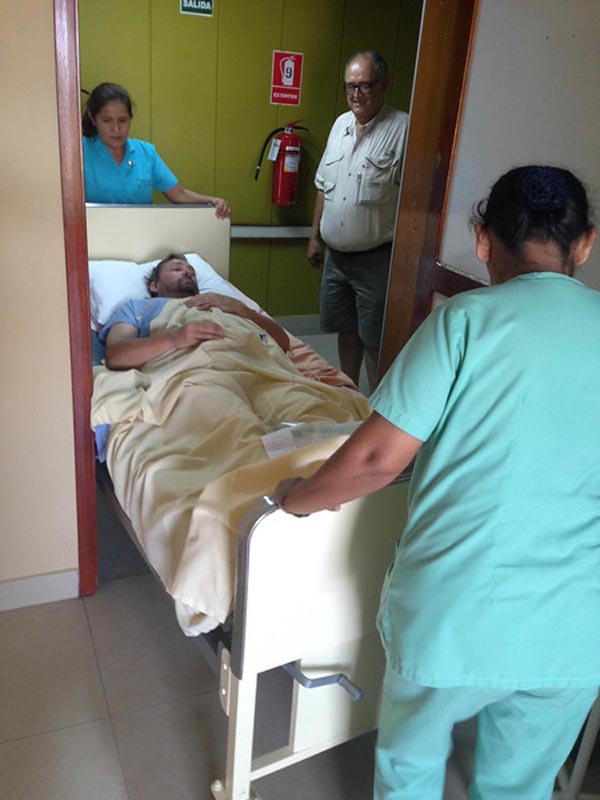 There wasn't a lot they could do for Dave in Iquitos except pump him full of painkillers and keep him lying flat on his back. I stayed in the bed next to him in our private room and took care of as much as I could with the help of Jaime and Pam of Explorama: International Expeditions' staff on the ground in Iquitos. If it weren't for them, I could have never gotten through this ordeal. They helped with translation, and paperwork, and communication between Peru and our insurance company in Canada. We arrived home yesterday by air ambulance and checked Dave into a hospital in our home town of Woodstock. It is amazing to have him so close to home and family. And I can actually drive back and forth to the hospital. He has fractured his L1 and L2 vertebrae and has been informed that it will be a long road to recovery. The doctor told him that it could be several weeks in the hospital. He would need another three months with physiotherapy to gain full mobility. But at least he will recover. He was warned it is going to be painful, but he'll get through it. If was one vertebra to break in the spine, this is the one. He doesn't have a threat of paralysis, just a lot of pain. 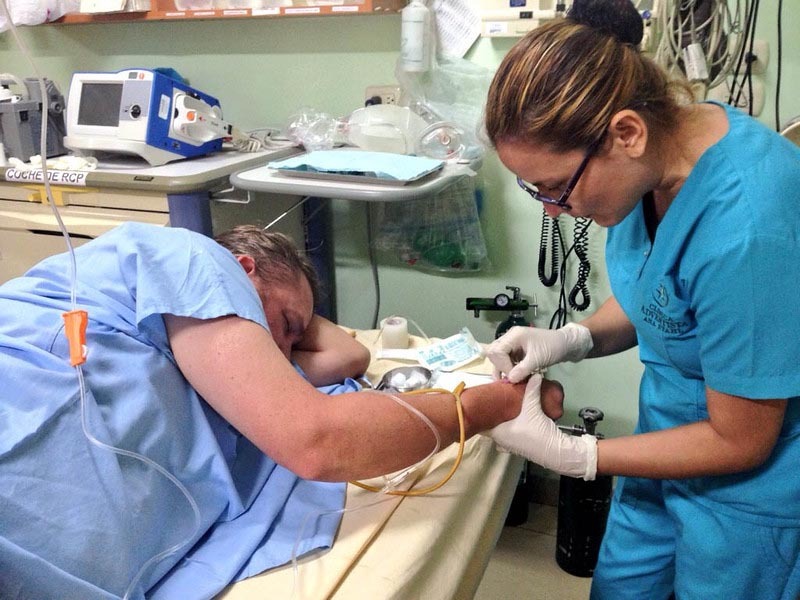 Having been taken off the strong narcotics that he was on in Peru, he is now feeling the full extent of his injury and he is in more pain and discomfort than ever. It brings me to tears to see him at the hospital as he cries out in unbearable pain. I came home last night expecting to get a good night's sleep so that I could be there for Dave at the hospital today, but instead, I am wracked with guilt for not being there to help him through his horrible night. He messaged me this morning to say that he had a really bad night and he is going to try to sleep so I should come in a couple of hours. I saw him during one of his episodes at 8:00 pm, and if his night was anything like that episode, it would have been unbearable. I should have been there so he could squeeze my hand. But I'll be there today when the doctors come in to start giving him all the grim news and I'll be there to hold his hand some more. He's strong though and I know that he will be able to get through this. It is going to be a difficult road but he has a lot of support. I've been leaving messages on my personal Facebook page all week and the overwhelming show of love has touched our hearts. I read everyone's messages each day to Dave in the hospital and it put a huge smile on his face. Things could have been much worse and this is a setback, but it is a setback we can handle together. The road to recovery is going to be a wild adventure and we'll keep you posted every step of the way. Note: A lot of messages have been coming in asking where Dave is staying. He is at the Woodstock General Hospital in Ontario Canada. Room 2522 Dave Bouskill. 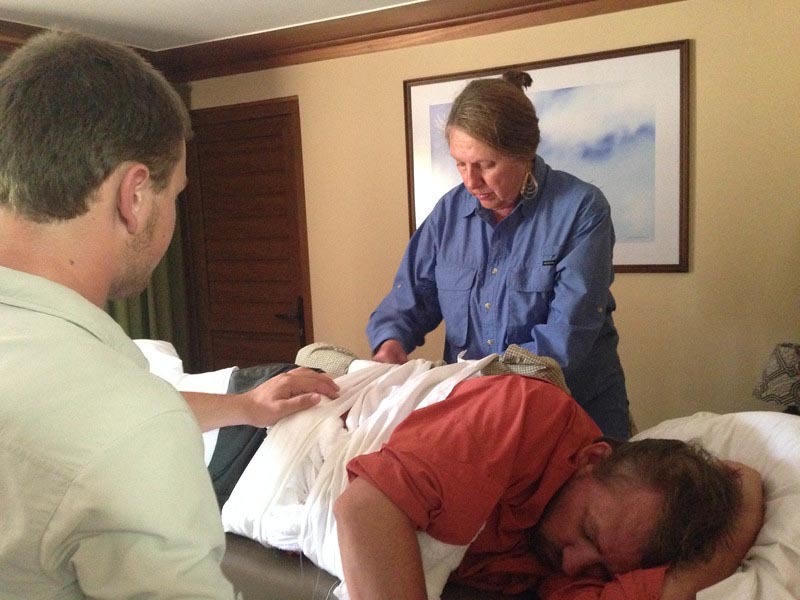 A huge thank you to International Expeditions and the Explorama Team for taking care of us and checking in with us and especially Jaime who dealt with early morning calls from Deb ranting and raving about Dave's medical state. They were true professionals. Note: We are American Express Ambassadors, but we did not endorse our insurance company because of that reason, we endorsed it because they worked hard to get us home from Peru, secured an air ambulance and covered our medical costs. You never expect to use insurance, but when you need it, it's good to have. And finally thank you to Joyce and Ryan for tending to Dave on the boat. I would have been lost without you. Giving me advice and your professional opinion helped me more than you could know. 102 Responses to "Dave’s Broken Back and a Little Healing Time"
Thanks for sharing and good luck on your recovery and health! It seems like it never happened. You are just amazing. Can you believe this happened? You’ve made such a miracle recovery. Inspirational! Dave you are my new hero I see courage and the fortitude of a warrior, keep on keeping on man. I appreciate the input about insurance, I have never even considered, wow thanks. I will pray for you and I am looking forward to your future travel. Best wishes to Dave! I’ve never really thought about purchasing travel insurance before, but this story is definitely making me think twice! 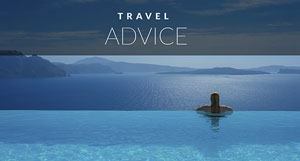 Are there any other travel insurance companies you’ve heard of that you might recommend? Really hoping Dave has a speedy recovery! Oh my! My back was in so much pain while I read this entire article. I really hope that Dave has a quick recovery. Sending you both positive vibes. Thanks Lexie! Dave is recovering nicely and expected to be back to 100% in a couple of months. We’re already enjoying taking the time to make our travel plans for 2015. I’m so sorry to hear about this! I hope you have a smooth and speedy recovery, Dave! I’m so sorry that you’re going through such a terrible experience. Thankfully, you’re now back home and I’m sure that Dave is getting great medical assistance and that he’ll fully recover, albeit this might take some time. I wish I was closer, and able to drop by and say hello. For now, I can only send you both a virtual hug from the other side of the pond. So sorry you had to go through this – can’t imagine how scary it must have been for both of you. Wishing Dave a speedy recovery, glad he is close to home. This is really scary; after all, it can happen to any of us. The importance of medical insurance can never be emphasized enough. Glad Dave is okay. Although we haven’t met, I do follow your adventures. Sending positive energy to you both! You are so right. We’ve had this discussion with people several times. We’ve always used travel insurance. All it takes is something like this to make the years of coverage worth while. Sending good thoughts your way. I probably can’t even imagine the pain (although, I did break my leg when I was 11…hit a tree full on while tobogganing, and that HURT). Glad that you had medical insurance, and could get back to Canada quickly. I pay for evacuation insurance here in Korea, and a lot of people think I’m crazy to spend the money. However, if something ever happens I know that I would want to go home. Ouch! Luckily you didn’t do more damage. Tobogganing can be so dangerous! Good for you for having evacuation insurance. When you are gravely ill, it is better to be home with people who can support and take care of you. Yikes! So sorry to hear about the accident but I’m glad to hear you had support along the way and were able to get home relatively quickly and Dave will be able to recover and hit the road again. Thank you for sharing your story and letting others into your world when things aren’t perfect – for the less experienced travelers out there it helps us learn from other’s experiences and feel closer to the community. Thanks Jenni. Yes, we are confident that Dave will recover. We’re not making any plans until March to give him ample time to get 100% back on track. We don’t want to push it too soon and then have any setbacks. I think it’s important to take the proper time needed to make sure the healing sticks. This is so terrible to hear. Wishing Dave a swift recovery so you’re both out adventuring again! Your love & support for each other through adversity is so wonderful. Thank you Amanda. We are very lucky to have each other. It’s been tough leaving him at the hospital at night. Last week I stayed with him a lot, but now it’s time to give him some space to recover on his own a bit too. So sorry to hear about this. I always tell other travellers to get insurance from my own experience, very happy you had some. Best of luck. I’m glad that you are spreading the word too. We’ve always been advocates of travel insurance. It’s always blown my mind when I hear people argue that it really isn’t needed or that it depends on the situation. Anything can happen anywhere at anytime. Sorry to hear about your terrible ordeal. I am glad there is some good news and that you will recover despite the difficulties you will have to face. Stay strong. I sprained my ankle in St John’s Nfld when I tripped on a hole in the street and and scraped my knee but I did my best to still enjoy the rest of my vacation. Even though I went through an ordeal it does not hold a candle to what happened to you. I always take travel insurance when I travel because on never knows. I am sending you all prayers. You are so right, you never know what will happen. Dave actually sprained his ankle in October while in Ireland. It was a pretty bad sprain and he wasn’t able to do a lot. It’s been an unlucky year for him. Let’s hope this is the last! So scary! But I’m so glad he’s in a good hospital near home now. I’m thinking of you guys and wishing Dave a speedy recovery! Thank you Ali, much appreciated! I can imagine what the medical costs would have been, thank god you didn’t have that to stress about on top of the injury. Wishing you a speedy and complete recovery. The medical costs would have been outrageous. The thing is, if we didn’t have medical insurance, we wouldn’t have had the option to go home. We would have had to stay in a hospital in Peru and we’ve learned that they weren’t giving him the best care that they could have. They told him that he’d be flat on his back for at least 2 weeks before they could do anything. Since coming home, they told us that is an old fashioned way of thinking, with a back injury it is best to get moving as quickly as possible (as long as it is a non-load bearing injurey. We are praying for Dave’s recovery and for your strength, Deb! Love from the Ready, Pack, Go! family! Thank you very much Monique. He’s doing better each day! Ugh! This is terrible and I’m really sorry he has to go through it. Luckily, he has you to ease the pain. Thanks Johnny. We both have said how truly lucky we are. I couldn’t imagine having to go through something like this alone. Wow! Thats terrible! Thank god for your insurance. I never used to get insurance, but now that I travel with my little boy I always do. It will take time, but you guys will get through it. Dan had to have his c2 removed due to a tumor, and it took him about 3 months to get out of hospital as well, and 6 months to be able to swallow and have the feeding tube removed, but we got there! At least on the bright side, he should be able to recover just fine and hopefully wont have long lasting effects. Oh my God, that sounds like such an ordeal. I’m glad he is ok now. That must have been terrifying. To have a whole vertebrae removed must have been very scary. Plus tumors are always a concern. I’m glad that you are all doing well now and glad to hear that you are traveling with insurance. You just never know. What an ordeal it must have been to get out of the Amazon rainforest in that situation. A few weeks ago I slipped a disc in my back and collapsed on my bathroom floor. I had an agonising 2 hour ordeal crawling from my ensuite bathroom to the bed only a matter of metres away. I was bedridden for a week. I can’t begin to imagine how excruciating an even more severe back debilitation + negotiating boats and planes would be! I’m so pleased you guys had medical insurance and that you’re back home safely. Wishing you a speedy recovery and return to the road! It was a huge ordeal. It took 10 hours to get to the hospital. I have that post coming out tomorrow! Dave’s been talking into his voice recorder on his phone about the ordeal too. In the coming weeks I’m going to work with him to right about his perspective. Through his recordings and chats, I’ll type while he tells me all about it. I’m looking forward to sharing how he was feeling because we were both going through very different emotions and feelings. Thanks for the well wishes! Ouch! A slipped disc is nothing to be taken lightly at all. What a bummer that you had to go through that for 2 hours! Now I know why so many hotel rooms in Europe have telephones in them. I think it is something we need to adopt here in North America. It goes to show, anything can happen at any time. I hope your back is healing nicely too! So sorry to hear this guys. But if anyone can power through it, Dave can. Great quote! I’m going to use it tomorrow on facebook! (I’ll be sure to credit you Matt 🙂 ) Thanks for the good vibes! Hi guys – my thoughts and prayers are with you both, and I’m sending healing energy for the pain. Dave, hope your recovery is swift and complete. Thanks Barbara, Dave is determined to get out of here sooner than they expect and I believe he will! Thank you Barbara. We appreciate you popping over to say hello. Those photos just say it all. I can’t even imagine the pain and fear. Here’s hoping he and you both come out stronger on the other side. Thanks for somehow still making all of this inspiring. We’ll miss you in DC! I hope Dave gets better quickly. What an ordeal. It is nice to know that the insurance company took care of you. I was on this same trip last year and we actually asked the crew what they do when someone gets injured. I never thought I would be reading about it. Get better soon. Oh man, this is just terrible. I’m glad this isn’t worse, as it easily could have been. I hope Dave recovers fully and swiftly and you guys are back on the road soon. Healing wishes and prayers for you both. Got a sense of deja-vu with this one. I fractured my L1 and L2 last year. I broke the front of my L1 clean off. My pain wasn’t too unbearable, so I feel for Dave. I’m sure it will ease off soon. If the fractures are like mine then he won’t be able to sit down for a month, but I was only passed fit to snowboard again after a year. So sorry that Dave might miss snowboarding this winter. It does highlight the need for good travel insurance, I was glad I was covered when they told me the only way to safely repatriate me was by air ambulance. Take care both of you. Just give it time, everything should be fine. Ouch! Wishing you a speedy recovery Dave, this sounds awful. As you say this article really highlights the need for travel insurance, especially when you are in such a remote place like you were. I can’t believe how long you had to wait for the plane to take him to hospital whilst he was in excruciating pain. I myself have had to claim on travel insurance a few times, once this year. 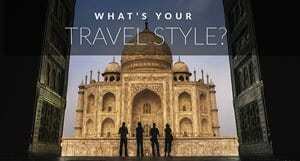 It is probably the one thing every traveller should have no matter whether you feel it is expensive or not. The fact is that you can’t afford to be without it. Sending good vibes your way; get well soon but don’t rush it as sadly these things take time! Mark and I met you in Greenland in September 2014 on a Quark Expeditions trip, and I have followed you ever since (not stalking, honest!). I’ve tried to contact you several times via email but ultimately emails bounced back. I want to express how thankful I am that you are ‘home’ and that Dave is safe and will recover. You are both such wonderful souls. This set back will not stop your spirits and life ventures, but will slow it down. Give yourselves physical and emotional healing time. Ultimately physical (and mental) health is paramount. Mark and I and our 32 year old daughter are excited to be re-visiting (for me at least) Antarctica in January. We will carry your spirit with you. Deb, Stay strong for Dave and yourself. You don’t need to get yourself sick by not getting your rest. He is lucky he has you by his side. Dave, hope you heal quickly. Thank God for insurance. Let us know if you want to come on air with us and share your story of the accident and the fact insurance is a necessary travel accessory to have. I’m so sorry to hear about Dave’s accident! Being in all that pain is awful, but a lot of fear is added to it when it happens in another country and your facing medivac. I’m so glad you had good travel insurance through all of this and I wish you the speediest of recoveries! Sending best wishes and healing thoughts your way! Oh my god that sounds like a terrible ordeal. I hope you have a fast and speedy recovery. Glad you got home fast and safe, and insurance does pay off. Thoughts & prayers from Chiang Mai! Sorry to hear that! Good luck Dave and hope you have a speedy recovery! Oh my gosh!!! I thought getting sick while abroad was bad, this is horrible! 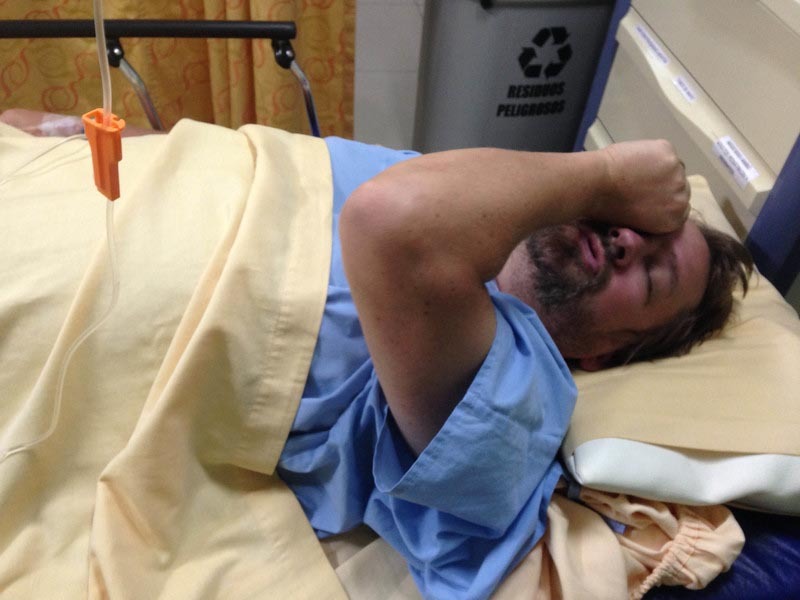 Here’s hoping for a speedy recovery Dave! Glad you are home safe and surrounded by family. Not to sound like your parent, but don’t forget to look after yourself too, Deb! You can only help Dave if you are well rested and 100%. I herniated my back a few years ago (L3/L4) and that was painful. I can only imagine how bad this hurts for Dave. All the best to you both and I hope the pain starts to come down in the coming days! Ouch! Dave if you didn’t want to meet with us in Washington D.C. a simpler excuse would have worked fine. You will be in my prayers for a speedy recovery. Things can happen so fast, and isn’t it always when you least expect it? It sounds like you had great support every step of the way and the help Joyce gave you makes me proud to be a nurse-we are never off-duty. All of your kindness toward others across the world will come back to you now in your hour of need. Take time, take care of yourself (it’s just as hard on the caregiver Deb) and know that we are all behind you. That’s terrible news!! I can’t image the pain Dave must be going through and the ordeal you both went through. Glad to see that you’re back in the states. I hope Dave has a speedy recovery. Oh no! I’m so sorry!! I’m so glad you were able to get back home and that you’re in good hands. I wish you a very speedy recovery!! Sounds like Dave has had quite an adventure, but one that he would have preferred not to have. He was incredibly unlucky to have the accident in such a remote area and when doing something that didn’t seem to present any danger. But at the same time he’s also very lucky that things didn’t turn out worse. At least he still has a smile, so hopefully that will help him through the coming months. Take care Dave. And take you flash with you next time. I’m SO sorry this has happened to both of you. Such a quick decision, simple misstep and long and painful road to recovery. I never travel without insurance and have MedJet to evacuate me in a case such as this and am amazed that everyone doesn’t. His physical pain and your emotional pain must be nearly unbearable. I will be thinking of you and wishing you well. Please keep everyone updated. OMG! What a grueling experience for both of you. As a physician, I have seen pain and it is horrifying, especially back pain, which can be excruciating even to make a slight movement. I often worry about something like this happening and it is so crazy to think that one little slip could cause so much damage in the blink of an eye. I wish Dave healing and pain free nights. I wish for you strength and courage to be his rock. Recovery takes time, so be patient as well. Prayers are coming your way. Oh guys, that’s a really scary story! So sorry to hear it and wishing Dave a speedy recovery! So happy that the injury wasn’t more serious and that the prognosis is bright! You guys are so strong and are an inspiration to all of us. I have no doubt that you will get through it all and come out even stronger on the other side! Know that we are all thinking of you and sending you our love and best wishes! I am so glad you are home and that Dave is getting the care he needs. I cannot even imagine how scary of an ordeal this was – and how scared you both must have been. Wishing you both many happy small steps towards recovery! I am sending the two of you positive thoughts and good wishes for Dave to have a speedy recovery. I can’t imagine how scary it must have been. Thank goodness for insurance! I’m so glad it’s something that he can recover from, even if it will take longer than one would wish. Having been through amoebic dysentery with my husband in rural Cambodia that required medical evacuation to Thailand, and a knee dislocation on the Antarctic Peninsula that resulted in Deep Vein Thrombosis and 8 months of physical therapy myself, good travel health insurance, and a hearty amount of legwork to know what to do in an emergency, is absolutely vital. 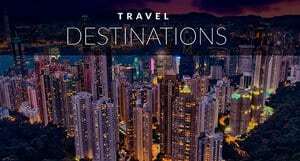 I’m a long-time reader and have done an extensive amount of travel like you guys, and am so sorry to hear that this happened! You will get through it, and you will come out stronger on the other side. Nothing like an excruciating, non-functioning limb and the terror of a clot to make you appreciate literally every milestone on your path back to health. I’m now stronger than I was pre-accident, and more protective of my fitness and health than ever. Hope you have the same breakthroughs, Dave! We are thinking and praying for you both. So great to hear about the strong support you’ve had from the folks around you. 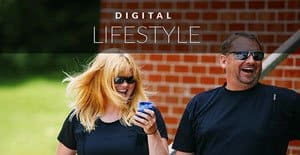 And Deb, I’m blown away that you can actually write a blog post and even take photos through it all. You’re both absolute stars and truly beautiful people. Holy moly… seriously, holy moly! What an intense few weeks this has been for you guys! Dave, I am SO happy that you are back in Canada and so close to home, friends and family while you are healing. While frighting that you have broken your spine what fluke it was that the breaks are where they are! It may be a long road but know you have friends from every part of the world sending you love, hugs and healing vibes. We’ll be there quietly (well, some of us more vocally!) cheering with each progression you make and can’t wait to see you standing and adventuring again in the future. Stay strong and a speedy recovery! Deb, I just want to give you a huge hug. It may have been Dave that was injured but we can’t forget that you – as his support, his wife and best friend – are in pain seeing him go through this. I hope now you’re home you can rest a little easier knowing he is being cared for and things are happening. If you ever need anything this Aussie is here for you with hugs, love or a wine if you need. I love both of you guys dearly and wish both of you the best of luck on this journey. Breaks my heart that you both have to go through this and in the middle of an Amazon adventure. Massive love and warm hugs from us in Wales. Whatever else we Benders can do we will do too, please let us know. This is so painful to read that I can’t even imagine the reality of the situation. I met you both at TBU Italy in 2012 and you were so upbeat and positive I’m sure you’ll conquer this as well. Many good wishes are going out to you both from around the world. How awful! Thank goodness for travel insurance. I hope Dave will be good as new in no time. Thinking of you both and sending healing thoughts your way. It’s been crazy following you guys over the past week or so…happy to hear you’re back in Canada-land and Dave can begin the long process to recovery!! What an ordeal. I can’t imagine the pain Dave is having to deal with. So glad to hear he will heal okay. Take care of each other. We are all here thinking of you. Big hugs. You guys I’m so sorry for you. I’m sending you ll the support I can right across the ocean all the way from Belgium to you. Thinking of you guys and hoping Dave will feel better soon! Sending you two our prayers and love! Here’s to a speedy recovery. We’re thankful that you’re back in Canada. We adore you two and can’t wait to see you overcome this obstacle. I admit it. Reading your account made me cry. Thank goodness there will be a happy ending to this story. But, in the meantime I understand how brutal this has been for you both. Not only are you both adventurers but you are also true journalists – making notes, taking pix. Be proud of yourselves and how you handled things. Sending you both a huge virtual hug – one that doesn’t hurt. Guys, holy crap. I’m just happy to hear everyone is okay. 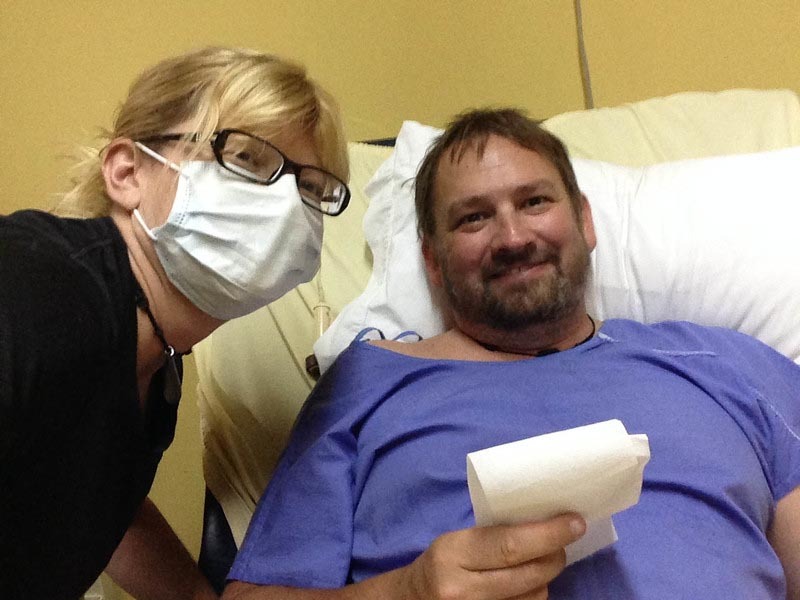 I’ve had a couple major medical snafus while traveling and I know the difficulty of it all. It’s not easy, but we get through it. Best of luck in your recovery, Dave. I’m thinking of you guys! I cringed reading this, both for how much pain Dave must be in and for you watching it all happen. I know he’s a tough guy so for him to scream it must have been agonizing. Wishing him a speedy recovery and both of you the strength to get through it. Much love from Munich. Despite talking with you and reading all the updates on your FB profile, it still seems surreal to read the full account here. 🙁 You know I’m thinking of you both and wishing Dave a speedy recovery. I’m the first to advocate the importance of having insurance when you travel. I have Cigna International and it’s a dream. It covers me 100% internationally and in the US it’s more like a standard policy subject to deductibles, etc. I’ve had to use it a number of times and I’d be lost without it. So sorry this happened to you guys! I followed your updates on FB but thanks so much for sharing the details. He must be in so much pain but it’s great to hear that he can make a full recovery and there is no danger of paralysis. And thank goodness for insurance!! Great recount Deb. I felt like I was there. Hindsight is always 20/20, so don’t second guess that decision to get the flash. This is such a fantastic story. I loved Dave’s smile in that last photo; already he’s getting better. Here’s to a speedy recovery for you both. At least Dave had pain killers :-). So sorry you guys are going through this, but VERY glad to hear it’s not something permanent. Get well soon, Dave! And Deb, please take care of yourself as well for the tough journey to recovery that lies ahead. You guys are in our thoughts! I openly shuddered reading the part about when it exactly happened – I cannot even imagine the pain that Dave is in, or what a horrible ordeal this must also be for you Deb. I’m always amazed at how something that happens in one split second can have such incredible and lasting consequences. Sending you love, courage, and strength! As well as wishes for a speedy recovery! Here’s to supportive spouses 🙂 When Cris had her internal bleeding and emergency surgery back in March of this year, I can’t imagine the pain she went through, but she let me know that my being there every step of the way helped ..and you (Deb) are doing a spot-on job being there for your man through every bit! Chin up, Dave! Part of adventuring means the occassional tiff with nature and “life”, and while it might be a long road to recovery, we’ve got your back 🙂 No pun intended! If I was in the area I’d stop by, but in the meantime….good vibes from Mexico and here’s to a quicker recovery than they plan! All the times I’ve slipped and slided on smooth concrete sidewalks in my tractionless flip flops have made me realize how easily this could have been me. As a guy who have periodic back problems (spasms, pain, etc), I can appreciate that the worst kind of pain comes come of the back region. I can only imagine what Dave must be going through right now. SO sorry you guys are going through this. My sister fractured one of her vertebrae several years ago and I remember the recovery for her. The good news is it inspired her to become one of the most capable physical therapists around (she helped me heal from a shoulder surgery) and she’s happy and healthy now. Seeing her recover and recovering myself lets me know that being surrounded by good people and having a great attitude can make all the difference in the world. Lucky for Dave he has both. Sending good, healing energy your way and hugs to both of you. I cannot imagine the pain and discomfort you must be going through Dave. 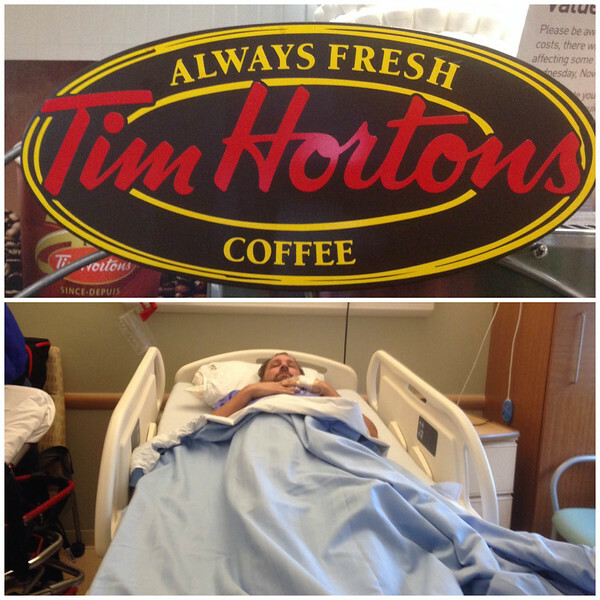 Best of luck on the road to recovery! Glad you you have someone like Deb by your side to support and care for you!